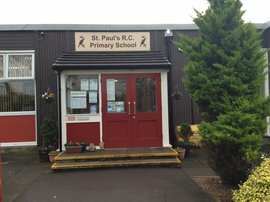 We have had a great time here at St Pauls school and we will miss all of the great sports competitions that we have entered. As I have came to the end of year 6, I look back at all of our achievements and take great pride in remembering the fun that we have had as a team. The teachers at my school are a grest help and encouraged me all the way. I started of with cross country and my love for sports grew, I then joined the girls football team and the netball team. My favourite sporting activity was Robin Wood, where we enjoyed activities from swinging through the air on the giant swing to crawling underground in the caving. Whilst we were there, we enjoyed having our own responsibilities. We have had lots of fun and have got lots of great achievements. I will always remember my time at St Paul's as great, exciting and inspiring. In our school you get to go to many many competitions and I have been to a good few of them. I especially liked the cricket competition. I enjoyed this because we worked as a team and we weren't down hearted when we came 4th and we still held our heads high. In year ,6 you might get picked to go to the district football trials. Then you might get picked for the school football team. There are many different teams you can play in and everyone gets a chance to go to a Level 2 competition.